In my pre-child days, I used my infinite wisdom gathered from books and scholarly articles to counsel my student’s parents about how to talk to their children about divorce, death, illness and even school difficulties. Parents loved to talk to me and bounce their troubles off my desk knowing that even if I didn’t have an answer right away, I’d find anything I could to ease them through times of difficulty For the length of my son’s pregnancy, I read every book I could find on how to raise children, taking special interest in having those difficult conversations. You see, my youngest brother is adopted from India, and my other brother is in the military and we rarely see him. Add to this that my mother died two short months after I got married, and my father remarried a few months later. Needless to say, I’ve had plenty of experience talking about the tough things in life, including race and war. My youngest brother was nine years old when my mother died, and due to the circumstances and timing, I spent a lot of time one-on-one with him. We talked a lot about our mother, how ill she had been, and how he was doing in accepting her passing. I felt like I was closely bonded to him from the experience, and even when my father remarried, I was still able to stay in his life for awhile as a close friend and not just as the big sister. I hated that our life had made these conversations necessary, but at least I felt like my sweet baby brother, now a manly 16, never needed to feel alone. When my son arrived I realized that in time, I’d be responsible to explain to my children why my mother wasn’t present. I panicked. Despite what I had thought was a close-knit family, I realized in the months after my mother’s passing that she was what held us together. My father increased his distance from me, and when my first child was born, informed me that he had no intention of being involved. 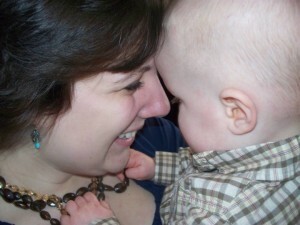 I avoided the tough conversation about who my family was with my son for as long as I could. Honestly, I needed to grow as a person myself before I could talk about it with an impressionable child. As sad as things are and as much as I wish they were different, my family is still my family. My father is missing out on two beautiful children who would adore him for more than the siren on his squad car. But I don’t want my children to walk through life thinking that “Paca” has rejected them. He’s still my father and I still love him, even if he doesn’t respond in a way my children will never understand. As my now almost 2-year-old daughter has grown, we’ve realized that she is a mini-me. I find it fun to look through old photos and note how much she is like me. It’s fun to read through my mother’s journals from this time in my own life and read about my antics, 30 years ago that were exactly the same. In looking through these photos, my son one day demanded to know who that lady was holding his sister. I sat down with him and my photos and showed him me as a baby, my daddy and my mama. He looked at all the photos seriously, taking every word in, until I told him that “Paca” was my daddy. Now, he understands that his own daddy has parents and that they love daddy like we love him. He understands that his daddy has a sister and brother and that they are all family. So I went through the same explanation about my daddy and mama. With a solemn expression he looked and me and told me that “Paca” wasn’t my daddy; that I didn’t have parents and I was alone. On that day, I walked away from the hard conversation. I closed the photo album and put it away. And I walked to my bedroom where I could cry for my mother without my son seeing me. In his mind, parents love you so much they sneak in to kiss you in the middle of the night and they call you four times a day when you’re at grandma’s house. To my three and a half year old son, a parent is someone who comes to visit and says I love you even when you’re all grown up and have your own home. And that is what a parent should be. So for now, I know that this hard conversation will just have to sit on the back burner. Little by little, I can tell him stories about when I was a little girl and squeeze in details about my mama. When he’s older, I’ll have to explain to him that she was very sick for a very long time, but she was on this Earth as long as she could be. Someday, I may have to explain that “Paca” is a sad man and just can’t love like we do right now. But we love him anyway. Maybe someday, I can tell my children how much I miss my mother and wish she were here to see them. She’d be just enamored by them, I know it. But today, instead of talking about the death of someone he never met and the separation from someone who doesn’t notice him, I will talk about how I’m not alone. I’m not alone because I have him. I have his daddy and his sister. Yes, it’s hard not to have my own mama, but I get to be the mama for my children I always wanted to be . . . because I had one who loved me even when things were hard. Laura, you are a strong woman. Thank you for sharing your vulnerability and strength with us in this touching article about the real challenges of family life. Thank you Amy. Authenticity is my goal with my family and all relationships…. which, if it can help another person is totally worth the humility in sharing.